I found this article on home networking to be an easy to understand discussion of the basic requirements for setting up how a modern household can share their growing array of digital devices. Connecting with wires and cables has taken the back seat. Wifi capabilities have become an integral part of nearly every digital device involved with home computing. When computers first became available to the general public, it was rare for any home to have more than one unit, let alone a network of computers. But as modern technology became cheaper, more accessible and within the reach of everyone, tech-savvy homes are now linking up their laptops and plugging in their PCs into home networks. To set up a home network, you'll need a few basic components including more than one computer, hardware such as a router and software, either built in to the operating system or as a separate application, to co-ordinate the exchange of information. You will also need a ‘path' for the information to follow from one computer to another. This is usually supplied via a WiFi system. 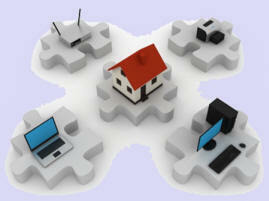 The two most popular home network types are wireless and Ethernet networks. In both of these types, the router does most of the work by directing the traffic between the connected devices. By connecting a router to your dial-up, DSL or cable modem, you can also allow multiple computers to share one connection to the Internet. With any network, there are always risks. If all of your computers are connected to the same network, a virus uploaded onto one computer will infect all the other computers linked to the same system. This is why it is imperative that you install effective firewalls and anti-virus software into your network to protect your system from outside attacks. Most routers combine wireless and Ethernet technology and also include a hardware firewall already built into the system, but you can increase your security by adding your own software protection. Software firewalls installed onto your computers block all incoming information by default and prompt you for permission to allow the information to pass. In this way, a software firewall can learn which types of information you want to allow into your network. It is advisable to regularly update your firewalls and anti-virus protection to keep hackers and malicious users at bay. Ethernet and wireless networks each have advantages and disadvantages. Wired networks provide users with plenty of security and the ability to move lots of data very quickly. They are faster than wireless networks, and very affordable. However, with wired networks, the clue is in the name - you will have cables linking your network so if you're not happy about a house full of cables to connect your system, a wireless WiFi network may be a better and more user friendly option. The system itself may be slower, particularly if a computer is further away from the main router, but you do cut down the amount of hardware and cables needed to create the network in the first place. Wireless networks are more susceptible to interference in the radio waves due to walls and distance of networked computers from the wireless router, but do allow you the freedom to utilise the system anywhere in the house (or even outside in the garden). Wireless networks are by far the most popular home networking system, despite some drawbacks and as the technology improves and routers become more powerful, are becoming the networking option of choice for the majority of home users.